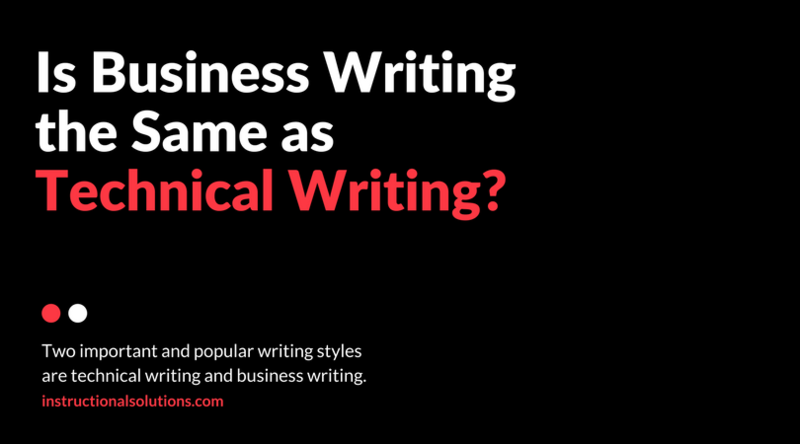 Is Business Writing the Same as Technical Writing? No matter your job, you need to be able to write. Whether it’s quarterly financial reports or daily safety records, writing is a common and crucial skill. Yet, the writing style of one field can be different and potentially inappropriate for another. Two important and popular writing styles are technical writing and business writing. You might see one or the other (or both!) listed in job postings, style guides or report requests. And you may be wondering: aren’t they the same? The short answer is yes and no. While the two techniques have similarities and overlap, one is not interchangeable with the other. They each have their own style, benefits, and roles to play. How do you know if you’re choosing the right style? This article will outline how the two styles align, diverge, and a handy question to check your text. Business writing is very reader-focused, as is technical writing. However, business writing ranges from interpersonal to information to technical. Technical writing and business writing overlap when a business person needs to convey technical information. An email from human resources that introduces a new employee is not technical writing. A highly technical report from a field geologist is technical writing. There is a reason that many people confound business writing and technical writing. The goal of the both styles is to be accessible. To accomplish that objective, writers will use concise language, specific word-choices and, often, a formal voice. In addition, bulleted or numbered lists are employed in both writing types to clearly present information. Professional writing differs from technical writing in its tone towards its audience. The audience, of course, is people internal or external to a business or organization. This audience is diverse, but will always need to understand the content and why it is important. That ‘why’ will be defined by the specific audience and the business’s goal. For this reason, the tone of business writing can vary a lot. For a proposal, persuasive language may highlight the factual aspects of the bid. For an internal memo, a direct formal voice may be used. For an external email to a new client, the writer may employ a professional but warm delivery. Each of these examples requires clear, accessible writing, but the intended audiences change the tone. Yes, business writing will often include technical information. But remember: good business writing clearly conveys both information and intent. Technical writing, on the other hand, rarely changes its tone. It has one goal, and one goal only: to clearly and effectively explain something. The tone is competency. Technical writing often communicates a specialized topic that is not broadly understood or is only needed in particular situations. Think of the instruction manual for a kitchen oven, the Read Me First documentation of a new software program, or the educational insert with over-the-counter medication. These documents contain specific instructions that are important for proper and efficient use. Do you need a be persuaded to learn how to set your oven to broil? Do you need a warm tone to understand the proper dosage of a pharmaceutical drug? No, not quite. Technical writing always has a neutral, competent tone. The text should be impersonal and use language that most effectively communicates instructions to the intended audience. That intended audience impacts the level of complication allowed within the text. An expert audience can be expected to have a certain understanding of a topic, while a general public audience needs all aspects addressed. However, a good technical writer will assume little and explain each concept so that it can be broadly understood. Is my goal to communicate intention or instruction? If your writing goal is anything but communicating instructions, then it is business writing and it needs to be written that way. If your goal is to provide neutral directions, then it’s technical writing. Selecting the correct writing style will make your writing clearer, stronger and more effective.